John CarrèreThe Flagler Museum has mounted the first-ever exhibition of the architectural work of Carrère and Hastings. “A Genuine Style: The Beaux-Arts Architecture of Carrère & Hastings,” features many never-before-seen drawings, artifacts and photographs. The exhibition was curated by the Flagler Museum, is sponsored by architect Jeffery W. Smith, AIA. Thomas HastingsBest known for their design of The New York Public Library (1897-1911), shown below, Carrère and Hastings designed many well-known landmarks such as the Pulitzer Fountain in Grand Army Plaza, The Frick Collection and Neue Galerie in New York; the Carnegie Institution, the Cannon House and Russell Senate Office Buildings and Cosmos Club in Washington, D.C.; and the Memorial Amphitheater at Arlington National Cemetery in Virginia. “The Flagler Museum is the ideal place for this exhibition, as Henry Flagler was the firm’s earliest and most loyal patron,” says Flagler Museum chief curator, Dr. Laurie Ossman. In 1885, Flagler offered the young architects (ages 26 and 24) a million dollar contract to design and build the Ponce de Leon Hotel in the burgeoning resort community of St. Augustine, Florida. 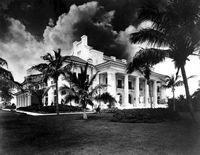 In 1901 they designed Whitehall, Flagler’s Palm Beach residence and now home of the Flagler Museum, a National Historic Landmark, where the exhibition will take place. “Within a few years of the Flagler commissions, their client list read like the Fortune 500 of the Gilded Age,” notes Flagler Museum Executive Director John Blades. The exhibition will include building designs for such notables as: John D. and William Rockefeller, Andrew Carnegie, Henry Clay Frick, Murry Guggenheim, J.P. Morgan, Mrs. Frederick Guest, George W. Vanderbilt, Edward H. Harriman and Alfred I. Dupont. The exhibition not only fills a void in the existing scholarship on American architecture and the classical tradition, but also creates a new context for understanding Henry Flagler’s national importance as a patron of architecture. Plans are underway to travel the exhibition in 2005, in conjunction with the publication of a monograph of the architects and their work.